The Flow Trio do that. Flow. They flow in a free manner. They flow because each player sets up the other players with what he does, allowing them to invent fertile extended collective improvisations. 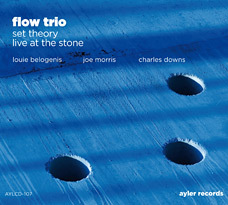 You can hear that at great length on their Set Theory: Live at the Stone (Ayler CD-107). Drummer Charles Downs flows in the density and speed of his free-timing, both creating momentum and responding to it. Joe Morris as bassist is ideal for this sort of set. He ranges widely in note choice, rhythmic happenstance, and sound color so that Louie Belogenis has a huge variety of choices that would work with what Joe is doing. Louie has that big, dramatic tenor sound that has a resemblance to classic Sam Rivers, but flows and darts in and out of the mix in an original way. His soprano has force and clarity. This is free music of excellence. It is probably their best disk yet. You wont want to miss this one if you dig avant sax trios in a good place. Do not miss them!